Refugees from Syria, Irak, Afghanistan and others from the near east are trying to reach the border between Greece and Macedonia (FYROM), they had to cross the small river Suva Reka, near the village Hamilo. Some refugees take a short brake on their walk to the border. Nadeloehr nach Nordeuropa Idomeni, der Grenzuebergang ist seit Tagen gesperrt,. Es ensteht im provisorischen Fluechtlingslager in Idomeni eine ngespannte Lage. Regen und Kaelte machen vor allem den Familien mit kleinen Kindern zu schaffen. 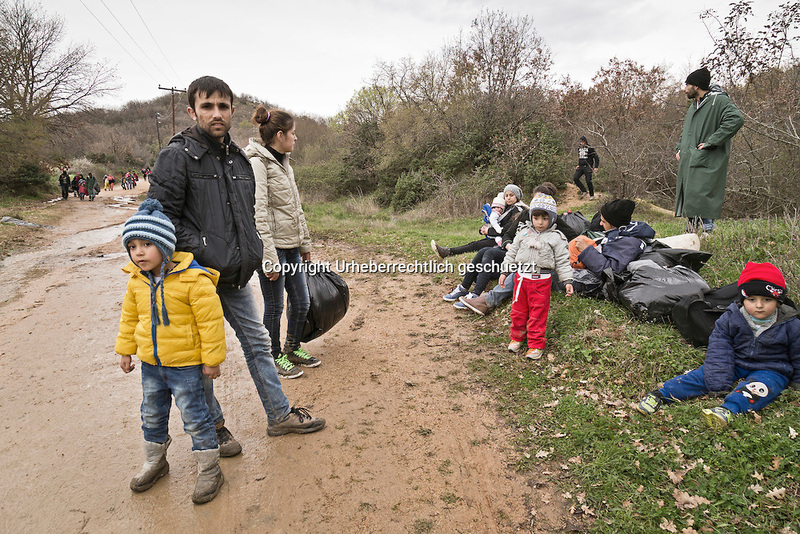 The FYRO macedonian authorities, closed the border from Greece completely. The situation close to the border gets more and more difficult. The People have to sleep outside or in small tents.